JetBull is an online bookie that likes to do things their own way. They don’t seem to be afraid of the bigger players in the industry, they run on their own platform, and they have won awards doing it. Bullish by name and bullish by nature, perhaps? A solid Sportsbook for fans who like to bet on the big games in all the major categories, they offer thousands of markets every day and an interesting live betting area in which to do so. Football bettors are especially well looked after, but plenty of scope in other sports plus a few niche markets provide enough diversity to keep things interesting. In total, there are 25 sports that get attention from the guys ‘n’ gals at JetBull, with Football, Tennis, Basketball, and Ice Hockey leading the pack. There is a token Special bets area too if you like that sort of thing – what will be the gender of Harry and Meghan’s baby for example – and fans of American Football could certainly do worse. The type of bets available are fairly standard but include Asian Handicap, and in general there is great depth of markets on events from around the world. Understandably there are significantly fewer markets when it comes to who will win the latest Floorball match – but honestly, who cares? While they aren’t big enough to always compete with a lot of the main players in the industry, JetBull are surprisingly robust in the odds they offer, especially if you like backing the underdog, and they often match if not beat some of the bigger brands. This is impressive work, although Horse Racing fans should note that while ante-post bets are available and competitive, JetBull don’t offer best odds guaranteed or cover the sport widely. 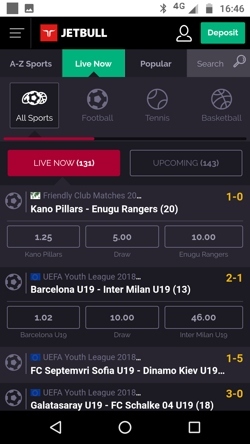 They also list odds in decimal format as standard which is worth knowing if those sorts of details are a deal breaker for you, although you can change this in your Betslip. 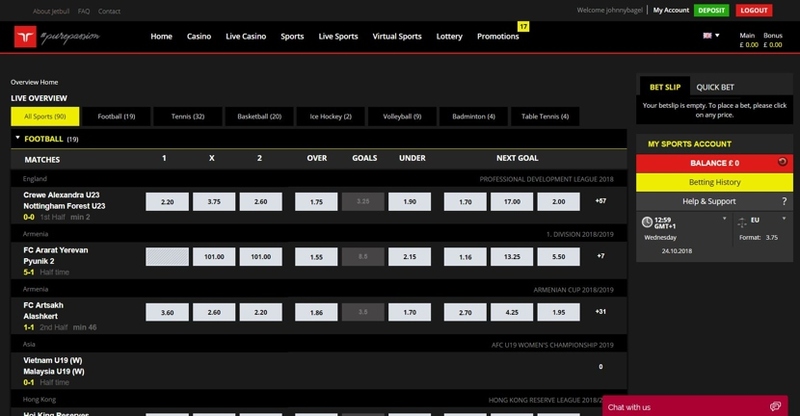 Commanding its own area on the website titled Live Sports, live betting is alive and well at JetBull. Even in the middle of the day you should find around 150 events to bet on with a varying number of markets. 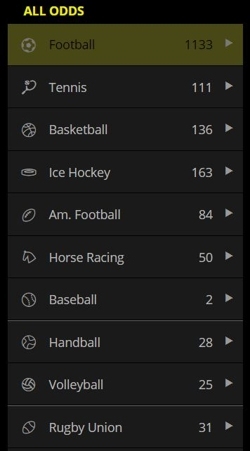 Football and Tennis feature most heavily, but Ice Hockey and Basketball also claim a spot, and you can find the odd Badminton and Table Tennis game too. In terms of markets for each event this really can vary: the Paris SG U19 vs Napoli U19 boasts almost 100 markets for example, but 50 is a good average for everyday events in most popular sports. If you like rummaging through stats before wagering then we hope you like Football, because otherwise there isn’t much available. The live graphic offers the most useful stats such as cards, corners, and possession, but it won’t satisfy those of you who like to be super analytical. The match display works well, though, so keeping track of what is going on is super easy. This goes for Tennis too, but that’s where it ends, most other sports just display the current score. If any more comprehensive stats are available they will be in a drop down menu below the video graphic, covering the form table, over/under, handicap and things like that. Expect to find this in any sort of quantity only if you are betting on big games/matches or on English football. Live streaming, sadly, is not yet available. Depositing at JetBull is free, and so it should be, but you only get a single free withdrawal each month which doesn’t seem very generous; after that, you will be charged at 1% of what you withdraw. This isn’t as much as some other sites, but still, 1% of a big win is a lot of money. Interestingly, though, Bitcoin is an accepted deposit method, so if you are into your crypto currencies this could be real a winner for you. 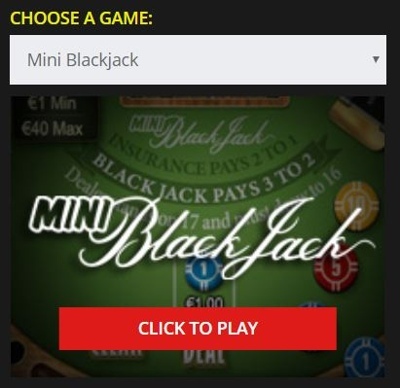 If you fancy a gamble on the side as you are mulling over your next wager then have a look at the mini games on the home screen. There are only a handful, but it’s a nice little extra if you are also a fan of gaming, and it’s something to keep you busy during the quieter moments of a match for example. Or rather, it would be if it worked. We couldn’t get a game to load, and even if we did, it isn’t possible to play and move around the site at the same time, so unless you are happy to sit in the same place on the home screen it’s mostly ineffective. Rather than playing the National Lottery with a chance to win millions, Jetbull allows players to wager on various different Lottery games that play out live, for the chance to win considerably less. These games run 24/7, and it’s more diverse than just picking the winning numbers; each game plays slightly differently and all offer their own selection of individual markets. It’s betting at its most basic level and the wins won’t be huge, but if your brain needs a rest it’s a good way to spend half an hour or so. 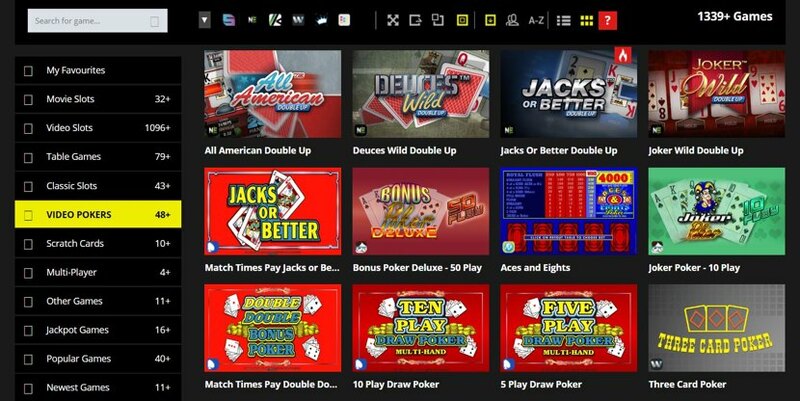 The Casino section of the site is heavily stocked and even bleeds into the Sportsbook slightly, with mini games available to play on the side. Your Sportsbook account will also work inside the Casino. There are over 1000 video slots to play with a good 200+ titles in other categories such as Table Games, Jackpots and Video Poker. These come from top developers too, such as NetEnt and WMS. The Live Casino is also busy with over 100 games to choose from, powered by Evolution amongst a few others. The desktop site is pretty clean cut when all is said and done. It is, modern, intuitive and offers some well thought out features to guide you to where you need to be. Everything functional is in plain sight but never takes up more screen space than necessary, meaning that the interesting stuff – the markets and odds – remain the star attraction. The site is packed pretty tight it’s true, but it is still incredibly easy to navigate, since there is usually more than one way to get to the place you want to go. There is also just enough colour (red and yellow) used against the black background to make the right features stand out. JetBull is owned and operated by EveryMatrix, and unsurprisingly, the site run on the OddsMatrix platform. You would never know that OddsMatrix is seen as a more budget option when using this site, since everything runs like clockwork. It is also the use of this platform that makes live betting such a pleasure. If you prefer to gamble on the go then you are well covered with JetBull’s mobile product. It works especially well for live betting, which you would imagine is what most people use it for; but it’s a solid all rounder in every aspect, and the more we used it, the more we loved it. The search bar remains for quick access to specific markets, otherwise, a combination of scroll bars and drop down menu’s display your options. You can easily transition to the Casino/Live Casino should you want to, although the main menu felt a bit stodgy to us in the way that it loads. 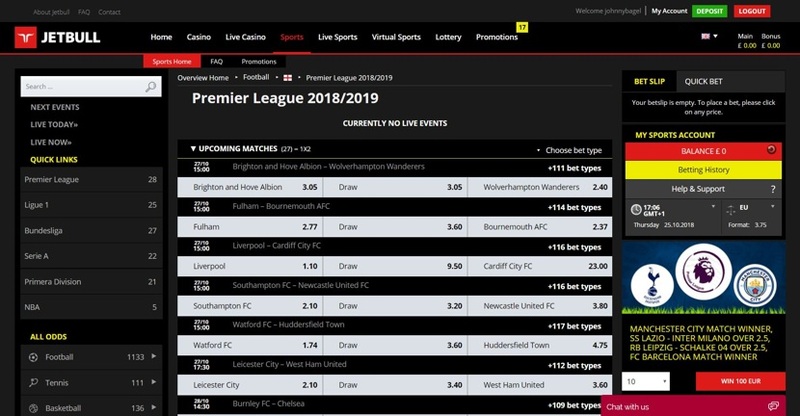 The site works quickly enough, it stumbles slightly here and there but there are certainly no major flaws that we could find – however, we couldn’t help feeling like there was something missing: the Betslip. This is nowhere to be seen until you actually place a bet, at which point a soft glowing button appears which then minimizes the Betslip as necessary. This actually works a treat, and it seems to respond more quickly than the rest of the site, too. We couldn’t find a few bits and bobs like the Lottery section for example, but all in all, this is a cracking little sidekick to the desktop site. Launching in 2007, JetBull has clocked up over a decades worth of experience in the industry, and within their first four years they won not one but two awards for their Sportsbook platform: Innovation in Sports Betting (EGR 2010) and Sports Betting Rising Star (EGR 2011). They might have been quiet on the awards front since then, but they have certainly not been resting on their laurels. The website was re-launched in 2010, and now serves as the flagship site for the OddsMatrix platform, developed by Malta based EveryMatrix who also happen to be the owners of Jetbull. This new website allowed the company to offer their customers much more, and now they can give punters 1000’s of different markets to choose from every single day. F1 fans may well have become aware of Jetbull in 2009, when David Coulthard became an ambassador for the company. What is on the menu then is first class, but with a number of issues recently where customer service response times are concerned, are JetBull losing their swagger? The punter who likes to take advantage of promotions would do well to have a gander at JetBull. They have a lot of them, and while many are aimed at Casino players there a plenty aimed at sports bettors too. Since the Live Chat is currently questionable at best, we wouldn’t recommend new players use it as a starting bookie, but if you are experienced and independent then you could make good use of some of the odds on offer. As a bottom line, we would say JetBull is best for the recreational player who knows what they are doing. Aside from a direct phone number, JetBull have covered all the bases when it comes to support, but there are one or two minor issues. 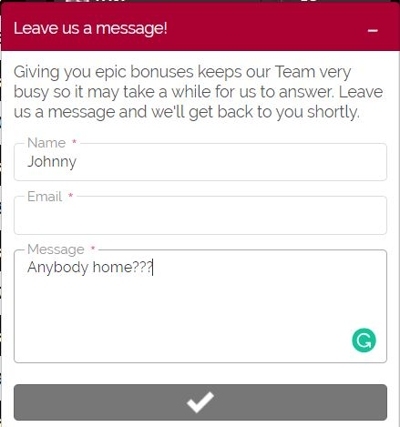 The Live Chat option is always in view enabling easy access to this particular method, and if they are slow to respond you will be prompted to ‘Leave a message’ and they will get back to you. We did have this issue midday on a Wednesday, we couldn’t get hold of anyone; we tried again later in the day and still nothing, so perhaps they need a few extra staff to keep up. This isn’t good enough. You can e-mail direct and they tend to be average at picking up questions and problems (we are still waiting more than 24 hours later), that is if the search bar in the detailed FAQ doesn’t find you what you need to know. The FAQ covers the most frequent problem areas, so chances are you can find the answer to your query in there. Customer Support is on hand 6am – 10pm 7 days a week allegedly. It would be useful for this to push a little later especially for potential issues during late night football matches or boxing events for example, but it’s not a bad effort at all. We feel we should also mention the high number of complaints floating around the internet. Obviously, we cannot know the ins and outs of each individual case, but we can say that the number of complaints is higher recently than we have seen elsewhere. JetBull have been active in replying to these complaints publicly though, to their credit. Live Chat – The easiest of all the contact options is always available via the button at the bottom of the page. We had some trouble getting connected so don’t count on it. Email – support@jetbull.com is the address you need if your query isn’t urgent. Phone – JetBull are keeping it digital – there is no phone support available at this time. @Jetbullgaming – The account only posts every few days but the content is interesting. Tends to be articles and predictions rather than flashy promo’s.